If you're considering any sort of job in one of the many criminal justice careers, chances are you have a lot of questions about what sort of careers may be available to you. One of the best ways to help decide what may be the best career path for you is to first gain a basic understanding of the American criminal justice system itself. By familiarizing yourself with the process by which crimes are investigated, and people are brought to justice, you can make a better choice about where you think you might fit. It's always a good idea to learn where your interests and talents may be of the most benefit, both to yourself and to the system. These three basic components make up the steps through which a person is arrested, tried and subsequently punished. Law enforcement may also include criminal profilers, special agents and civilian regulatory or investigative personnel. Once a crime has been detected, law enforcement officers write reports and collect evidence, and develop probable cause. Once sufficient evidence exists to show a person has committed a crime, he is arrested and brought to the court system for trial and adjudication or judgment. The court system is where an arrested person can stand trial, view the evidence against him and confront his accusers. During the court phase of a criminal case, the person who was arrested becomes a defendant. The court process is often a long one, and people may sometimes wait a year or longer before they are brought to trial. In most cases, they can go about their business freely, with some conditions, while they await trial. In extraordinary circumstances, though, defendants are held in jail until their trial. It typically occurs if they are considered to be flight risks or a danger to the public. There are many options available to a defendant once they enter the court system. Very few accused people go to trial. Many plead guilty or nolo contendre (no contest) before they get to trial. In these circumstances, the defendant will come to an agreement with the prosecuting attorney on a more lenient sentence in exchange for waiving their right to trial. After a judgment is rendered, the defendant is turned over to the corrections system for punishment if he is found guilty. In the corrections system, a defendant may go to prison or jail depending on the charge. Prison is a state or federal-run facility, whereas jail is controlled by local authorities. Prison is reserved for longer sentences based on more serious crimes. Jail, on the other hand, is designed for shorter sentences and for defendants awaiting trial. 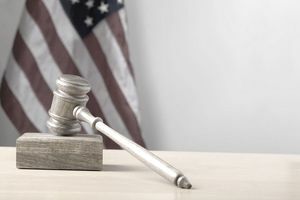 In many cases, those who have pleaded or been found guilty of a crime may be sentenced to some form of probation or may be placed on parole after completing their prison sentence. In these instances, they are able to go free but must report to a probation or parole officer while they are under supervised release. All of the components of the criminal justice system work together closely to ensure that justice is served and that accused criminals receive the best chance possible for a fair trial. The makeup of the American criminal justice system also provides a multitude of career opportunities for anyone who interested in working in the field of criminology.